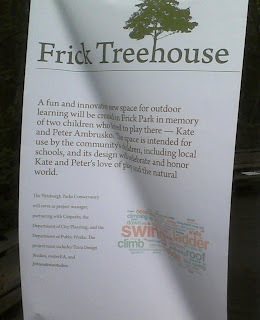 Last night, Jordan and I attended the third of three public meetings related to Kate and Peter's Treehouse. But on to the important stuff. At this latest meeting, once we arrived at the actual site, we were greeted by large posters about the project. Here are a few pictures. Unfortunately, the wind was blowing, and my phone takes crappy pictures, but it will give you some sense. There is no one thing at the top of my noodle, so here are some random ramblings about things I should probably know more about than I do. I wish I could do this post the justice it deserves, but I have big to-do list in front of me and not a lot of time. But here goes anyway. Two nights ago, I attended a town hall meeting that Raja, who is running for Allegheny County Executive, hosted. Two days prior, I received a recorded phone from Raja briefly explaining this event. Since I voted for the man in the primary, I had nothing else going on, and free refreshments were part of the evening, how could I say no?! When I worked at my last (almost full-time) job, I did not go out a lot without the kid for the mostly obvious reasons: I felt guilty missing the few waking hours I had with her, and I really just missed her. That is why while at my last job, I often talked coworker friends into two-hour lunches or leaving at 3 p.m. for early happy hour; I hardly missed any evening hours with J and I still got to have grownup fun. One would think when you have not worked regularly for over two years, the guilt of being away from your kid would lessen. But if you know me and how my mind works, you would know it really has not and it goes beyond money. Should we save people from themselves? Today's question is brought to you by some (of whom I consider) stupid parents. Maybe I am just being overprotective, but these things, in general, seem like a bad idea. Agree or disagree? A couple of kids in my neighborhood regularly ride their bikes helmet-less. I know "when we were kids" we did not do this, but the law states if you are under 12, you must wear a helmet when riding a bike. I don't know if it is parents (or kids) being lazy, feeling goofy, or not wanting to spend the money, but when you consider the statistics and how much more expensive it will be to pay for a hospital visit, why not just do it? I hope all of you had a nice 4th of July. I took some time to look over the Declaration of Independence, to remind myself of what the holiday is about. But let's face it, fireworks, cooking out, and spending time with family and friends are a nice part of the day too. 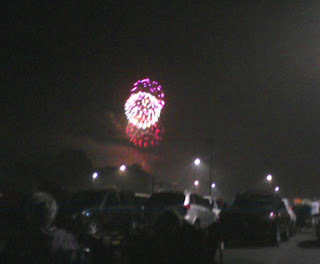 Here are a couple pics of some of the fireworks going off. We went to Monroeville this year to see them. I just can't bring myself to drive downtown with all the Regatta traffic. Turns out my tendency towards oldness was a good thing this year since everyone who went down early got drenched. On the other hand, we drove right into a store's parking lot about 20 minutes before the bombs were bursting in air, had a great view, spent some time together as a family, and were home about 15, maybe 20 minutes after the light display ended.